Toe Juice what is it exactly? 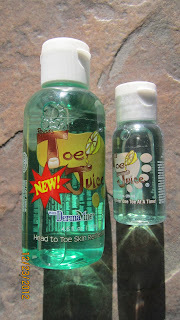 Toe Juice is a head to toe refreshment of the body. Have a rough patch of skin because you skinned it or just plain irritated it? Pour a little or a lot of Toe Juice and it seeps into the skin relieving the pain of dry skin. It works on warts, eczema, cold sores, psoriasis and much more. My son Michael has patches of eczema so I used it on him. Michael was in pain for a second or so because it's mostly alcohol so it burns.. but burning means it works. I was happy to see how well his patches went away and he was less itchy throughout the day. I tested it on Brian as well since he has had ringworm (yuck) and it has left a nasty patch behind his ear so I placed it on him and he who normally cries over anything touching it didn't even notice I placed it on him. Toe Juice seems great it has a smell of fresh lemons. Toe Juice can be purchased here and at most major retails. Disclosure: I was given samples of Toe Juice to help with my review. All opinions are 100% mine. I would use it on my heals. Of some dryness and itching. I want to try it for my feet! I have few patches of dry, itchy skin for which I would LOVE to try Toe Juice! I'm hoping it'll help on my cracked heels. Hopefully it will help the eczema for myself and my children. My son would use it on his eczema.